Just as the owners' teenage son, transitioned to adulthood, they discovered termite infestation in their circa-1994 house. This led to a major renovation that gave the adobe home a minimalist facelift. They are not shy to say that Real Living was a rich source of inspiration for this. 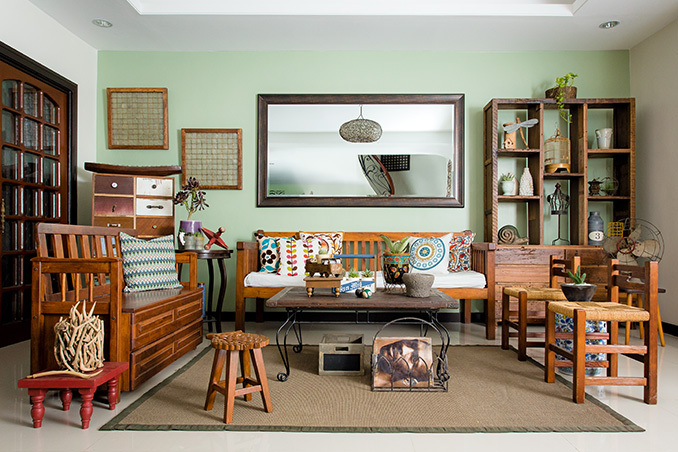 Various items in the house came from the trusted flea market haven, Dapitan Arcade. The spacious living area in neutrals is home to custom-made wooden furniture and colorful pillows. Sliding doors lead to the sunny lanai. From having separate kitchen and dining areas, these spaces now flow seamlessly into each other, letting more air and light in. In an effort to conserve electricity, the family used LED lights and appliances with inverter technology. In the master bedroom is a platform bed, with matching side tables custom-made by the couple’s trusted carpenter. An adjacent small stockroom was transformed into a home office. Meanwhile, the son's bedroom showcases white walls while the floor was left in bare cement. The headboard is an instant conversation piece as it was fashioned from an old gate. Read the original article ("Renovation Revolution") in the June 2014 issue of Real Living Magazine. Download your digital copy of Real Living on the Real Living App now! Log on to summitnewsstand.com.ph/real-living for more details.